Dymola provides a means to measure where the CPU time is being spent in the model code execution. This feature is known as profiling. Profiling is described in Section 5.7.5 of the Dymola User Manual Volume 1. This blog article supplies further information. When Advanced.GenerateBlockTimers=true a few timers are inserted in the code when Advanced.GenerateTimers =true a large number of timers are inserted and this allows finer analysis of the code’s performance. An example of the profiling information that is returned when a model is simulated is in Figure 1. These results were generated by simulating the Modelica.Magnetic.FluxTubes.Examples.SaturatedInductor model for 10 seconds using DASSL and with Advanced.GenerateBlockTimers=true. The 1st column in Figure 1 gives the name of the timing block. For further information about the different types of timing blocks refer to Table 1 found at the end of this blog post. The Block number (column 2 in Figure 1) makes it easy to find where the timers have been inserted into the dsmodel.c code. To find the start of the timer search for DymolaStartTimer(#) and to search for the end of the timer search for DymolaEndTimerName(#), where # is the Block number. Columns 3 to 6 contains timing information, from the results in Figure 1 most of the CPU time is spent calculating the simulation.nonlinear system. How often a section of code is called (i.e. column 7 of Figure 1) is important as improving the performance of the code with the largest number of calls will give a large performance improvement. 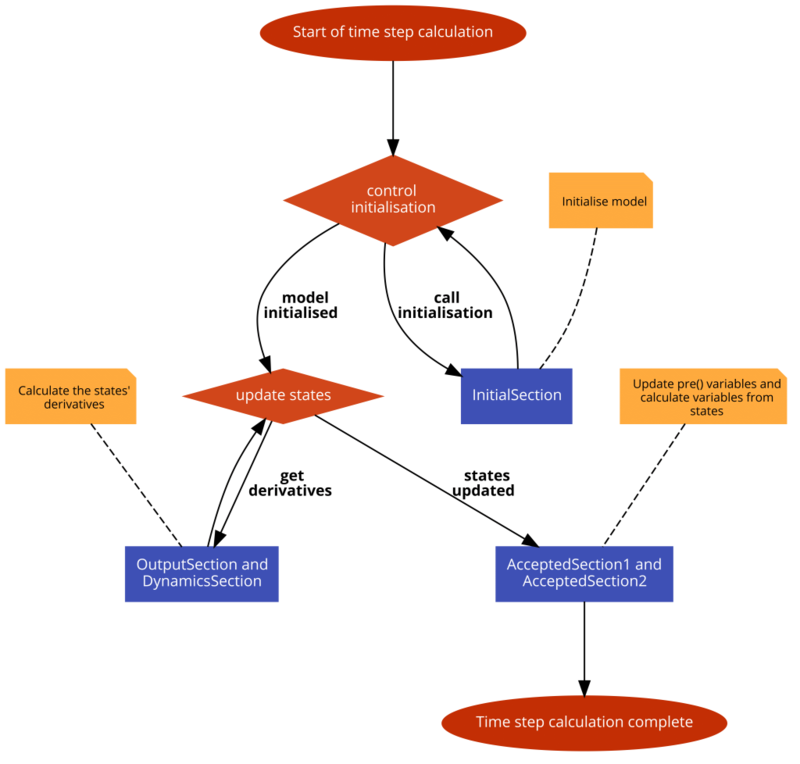 A basic flow diagram of how a time step calculation is performed is in Figure 2, this diagram helps explain why different code sections are called a different number of times. Figure 2. Simple flow diagram of how the model code in dsmodel.c is called when solving a time step calculation. The blue blocks are model code, red blocks are controlling code and yellow blocks are comments. The flow diagram was created using code2flow.com. The flow diagram in Figure 2 is of the control of the calls to the model code. The controlling code will call the InitialSection, the OutputSection, the DynamicsSection, the AccpetedSection1 and the AcceptedSection2 code of dsmodel.c. If initialisation fails the first time then the homotopy method is used and the InitialSection code will be called multiple times as the homotopy’s lambda value is increased to 1. Once the model has been initialised successfully then the IntialSection code is not called again. When an inline solver is used then the states are updated within the dsmodel code, in this case there is no DynamicsSection and only the OutputSection code. If an inline Runge Kutta method is used then the OutputSection code will be called multiple times depending on the order of the Runge Kutta. When the DASSL solver is used the DynamicsSection code is called multiple times until the solution calculated by the solver satisfies the solver’s requirements. In some cases the controlling code can detect that the states are non-changing for that time step, in this case there will be no call to the OutputSection and the DynamicsSection code and the states will remain unchanged. The AcceptedSection1 code contains code that does not directly affect the derivatives of the states, however, the past values of this code may affect the derivatives. An example of code that may be found here is the pre() functions used in logic expressions. The AcceptedSection2 code contains equations for calculating model variables that are dependent on the states of the model. There are many possible locations in a time step calculation where the code may fail, these failures have not been included in the flow diagram in Figure 2 to keep the flow diagram as simple as possible. AcceptedSection1 Code for which past values effects the OutputSection and DynamicSection equations. For example the pre() equations. Event handling The total time for model evaluations during event handling. Parameter code Assigning parameters, includes reading variables from files, string variables etc.